Hanne Orvik was a childhood friend of my wife Bente. As children and neighbors they played together and went to school together, until they eventually went to separate schools at age 14. They were best friends. Keeping in touch, they knew of each other’s doings for the next 15 years. Then through life’s circumstances they drifted apart, but surely would have welcomed each other warmly on any occasion, even after many more years had passed. 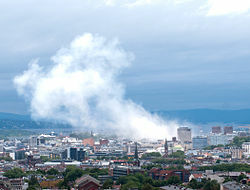 Hanne was murdered by a bomb blast set by Anders Behring Breivik in the government quarter of Oslo on 22 July. Steinar Jessen, from Alta in Finnmark, accumulating a mere 16 years of life, was a wonderful young man, showing great promise for a full and productive life. He was the grand nephew of the husband of one of Bente’s closest friends and longtime professional associate. Steinar was murdered in cold blood by Anders Behring Breivik on Utøya on 22 July.